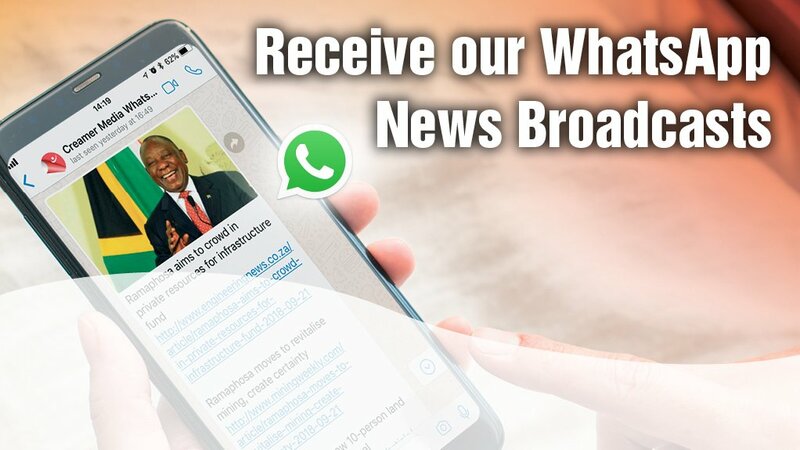 Creamer Media has launched a WhatsApp News Broadcast group that will send out links to the top three stories published on Engineering News, MiningWeekly.com and Polity.org.za each day. Add Creamer Media as a contact in your cell phone (not only as a WhatsApp contact, but as a contact saved on your phone). The relevant cell number to save when adding Creamer Media as a contact is 079 888 4522. Send an SMS or WhatsApp message to Creamer Media with your full name and cell phone number (for SMS’s standard rates apply). Creamer Media will then add you to the WhatsApp News Broadcast group and you should shortly thereafter start receiving the daily WhatsApp messages, which will usually be sent between 16:30 and 17:00 on weekdays. Note that your personal information stays private and will not be handed to any third parties. Also there will be no spam and reader comments allowed on this group – only daily news highlights.